‘Tis the season for warm sweaters and full-flavored drinks! It’s roughly ten years since we started penning this column and we can hardly believe we’ve not mentioned the Rusty Nail, the grandpa of all Scotch classic cocktails, and (for some among us) a total dad drink. 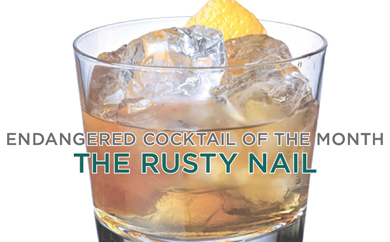 The Rusty Nail, by many accounts, was born in 1937 and named the B.I.F., supposedly after the British Industries Fair. It’s no wonder the drink never caught on with such a lackluster name and origin story. A mix of blended Scotch whiskey and the Scotch-based Drambuie liqueur in varying degrees (your bartender will have an opinion), the drink appeared on menus in various locales with different names for a few decades, from the Little Club No.1 in New York to the Knucklehead in the Midwest. It was christened the Rusty Nail in the 196Os by Gina MacKinnon, a Drambuie Chairwoman, and has been known as such ever since. The drink was quite popular with Frank Sinatra and the Rat Pack, and as such had a serious moment in the 197Os. Hence the dad drink status, for those of us who have dads of a certain age. We LUPEC ladies love drinking with our dads! As you gather with family this Thanksgiving, this could be a great way to wind down your meal and toast the holidays with your dad, grandpa, or any other dads who might be in the group. And Drambuie, with all its rich honeyed herbaceousness, will certainly make a lovely pairing with your pumpkin pie. The classic proportions are below; you can work out the perfect recipe among your guests. old fashioned glass with ice and STIR.